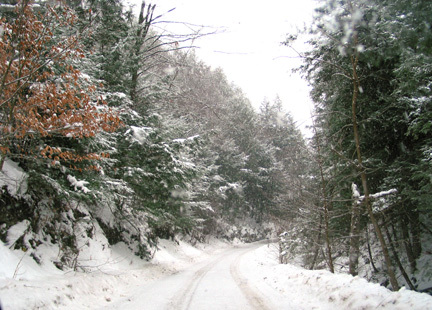 The Ski Club is located at the end of Roaring Brook Road, a gravel road in South Williamstown, Massachusetts. The town maintains the first 0.4 mile of the road to a small parking area for the Roaring Brook Trail. Please plan your ski day around 2:30 PM. If this policy is inconvenient, you can park in the trail parking area and walk up the final 0.3 mile at anytime. Continue on US Route 7 for 0.7 miles north of the Williamstown/ New Ashford town line. You can use Google Maps or most other on-line directions to find us. Our "street address" is 285 Roaring Brook Road, Williamstown, MA, 01267.